DENVER ” Colorado winemakers say mild weather during late summer led to slow ripening of wine grapes for a good vintage year and record harvest. Colorado’s viticulturist Horst Caspari estimates this year’s harvest at between 1,800 to 2,000 tons, up from the 1,515 tons harvested in 2006. Wineries are located throughout the state but the main wine grape-growing region is located on the Western Slope. Vineyards in the Grand Valley near Grand Junction reported high yields but frost damaged some crops in a smaller growing region near Paonia. Wine grapes mature in August and September. “It’s our biggest and one of the better quality harvests we’ve had,” said John Garlich, owner of BookCliff Vineyards. The winery owns and manages 33 acres of vineyard in Palisade, about 230 miles west of Denver. 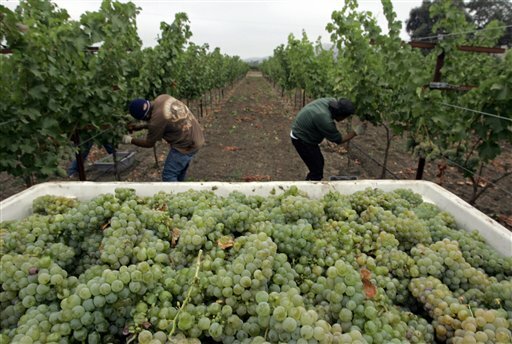 A survey of some of the state’s 75 wineries found winemakers finding good quality grapes. “It was a long, not terribly hot season. We got great ripeness,” said Nancy Janes, winemaker at Whitewater Hill Vineyards and Winery in Grand Junction. Jackie Thompson, winemaker at Boulder Creek Winery, said their merlot and syrah wines are now aging in barrels. The last notable vintages were in 2005 and 2006, according to wine enthusiasts. The harvest in 2007, meanwhile, was just 700 tons following unusually cold weather in late 2006 and the spring of 2007. Most of the state’s vineyards are located in the Grand Valley along the Colorado River and the West Elks region along the North Fork Valley of the Gunnison River at an elevation from 4,000 to 7,000 feet.